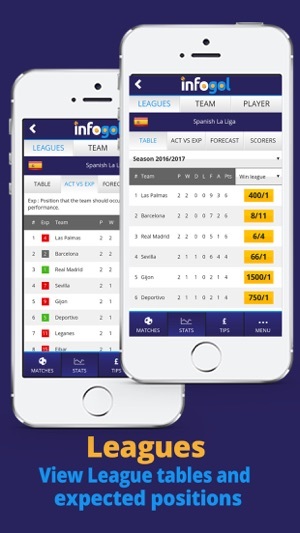 Keep up to date with the latest live scores, results, betting tips, odds and fixtures of your favourite football teams with the Infogol App. 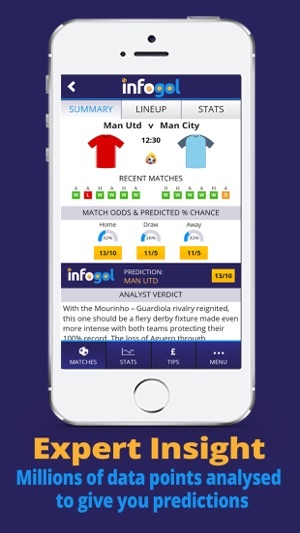 We’ve analysed millions of data points to form our model and give you expert match insight, statistics and soccer tips at the touch of a button – Infogol really is the football analyst at your fingertips. PRE-MATCH: The pre-match summary gives you helpful insight including the ANALYST VERDICT on the match. We’ll also bring you the line-ups and form guides, as well as our unique SMART STATS and FLAGS. IN-PLAY: Unable to watch the match? Get LIVE SCORE UPDATES and keep up to date with the latest action and odds on the Matches screen. And in our latest update we’ve added a HALF-TIME TEAM TALK. Based on the events of the first half and the pre-match expectations, our model gives you helpful in-running football predictions to allow you to bet in-play. RESULT: Find out WHO SCORED each goal and shoot over to the MAPS screen to see the quality to each team’s chances. 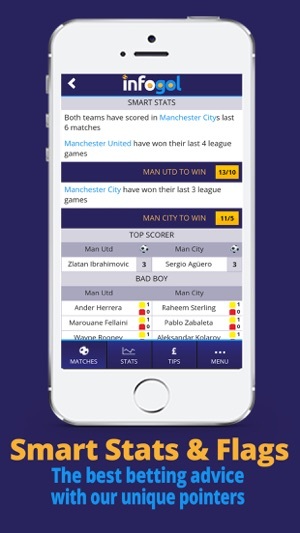 Get football results QUICKLY and EASILY! Hit the STATS button and you will get in-depth analysis of the match including statistics for passes, shots on target and much, much more. See football odds for your teams and matches from BOOKMAKERS such as Betfair and Paddy Power; these prices are in real time and ensure you know the best odds available at the right time! LEAGUES: Get great coverage of some of the top football competitions around the world. For each league you can see the current table standings as well as our interpretation of where each team should be NOW and at the END OF THE SEASON based on our model. TEAMS: Choose a team from any of the leagues and get a summary of their performance, results and fixtures lists, squad details and a whole host of FOOTBALL STATS to help you understand more about the team’s style of play and their strengths and weaknesses in attack and defence. PLAYERS: Get CAREER PROFILES for every player, including their stats in the current season and those gone by, and check the TOP SCORER Charts. We also give football betting predictions in the FIRST TO SCORE and ANYTIME GOALSCORER markets. Get free football predictions, free bets and betting tips based on the data from our EXPECTED GOALS MODEL. Whether you like to bet on the result of the match (Home, Draw, Away), Overs/Unders or Both Teams to Score, our soccer tips have got you covered. 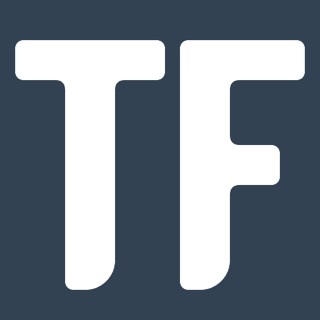 As well as football betting tips for each match, we’ve added in-depth EDITORIALS PREVIEWS from our soccer tipster to help enhance your understanding and enjoyment. In 2016/17 the Infogol tips operated at over a 40% STRIKE RATE, returning big profits for users! 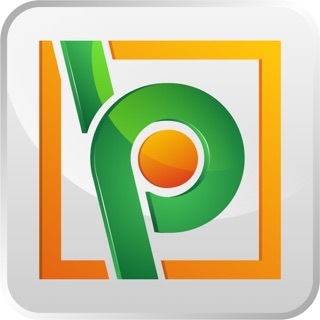 Get PUSH NOTIFICATIONS for your FAVOURITE TEAMS and SELECTED MATCHES. 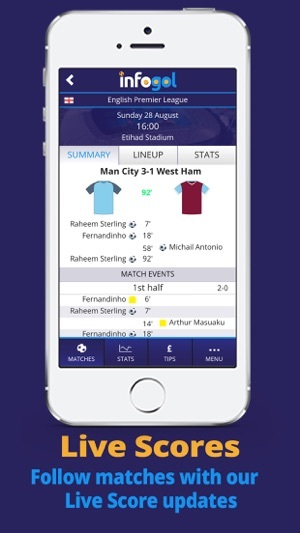 For each match, simply tap a Star to be notified of the Line-ups, Analyst Verdict and Half-Time Team Talk. And you can also be notified of the Analyst’s BEST BETS. 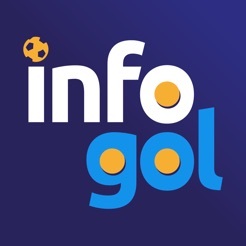 Infogol is so much more than just another flash Live Scores football app. The strength of the app lies in the super quality of the analysis, based on our in-house developed models, powered by Opta data. The Infogol analysts also use their knowledge to help assess a team’s rating based on past performances, manager or player changes etc. 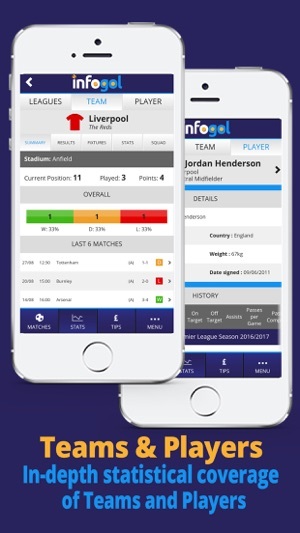 Combining the knowledge of the analysts with the figures produced by the models means that Infogol is the ultimate app and has unrivalled power when it comes to football tips and predictions. We currently cover the English Premier League and Championship, La Liga, UEFA Champions League and Europa League and Brazilian Serie A Campeonato, but we continue to evaluate adding competitions on a case-by-case basis – so watch this space as we build up to World Cup 2018. I am not sure if you already do this and I haven’t located it but I think you should still be able to see tips in running. I love your app and find it very useful. Just started using the app and it’s given me a new level of approach. Highly recommend it.